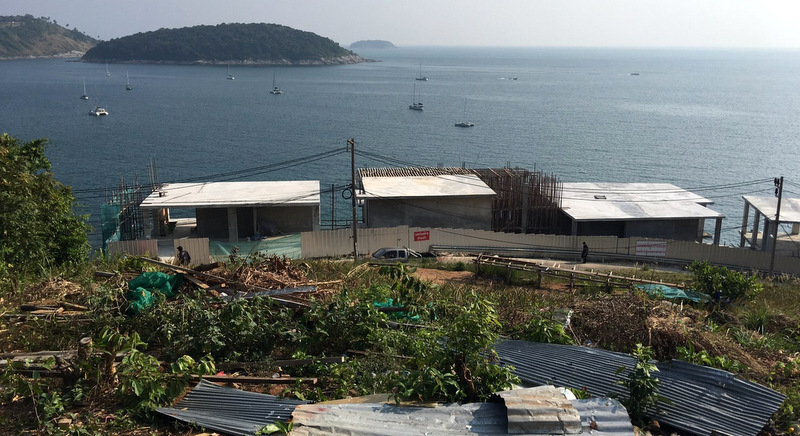 PHUKET: Construction of the luxury residence at Krathing Cape, overlooking Nai Harn Bay on Phuket’s southwest coast, has been ordered to stop following an inspection yesterday (Feb 12) that deemed the site to be on protected forest land. 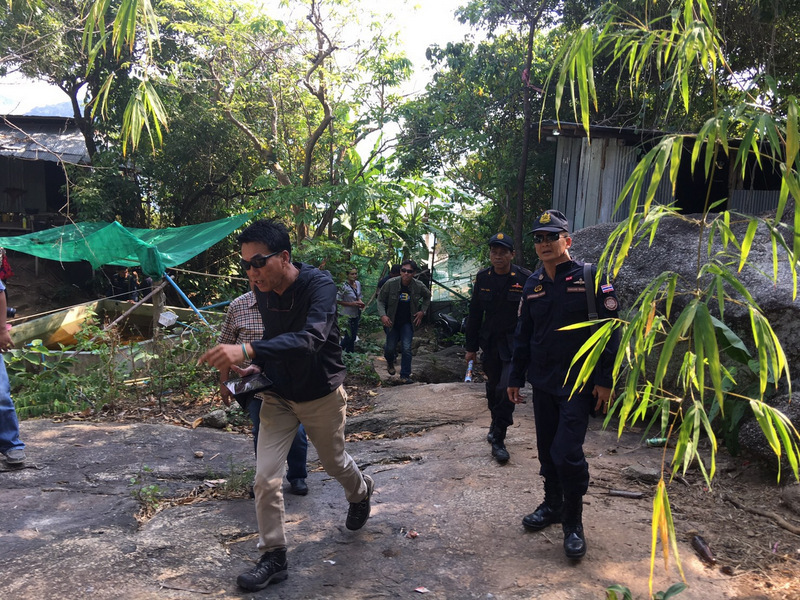 The order was handed down after an inspection by officers from the Department of Special Investigation (DSI), the Ministry of Natural Resources and Environment (MNRE) and the Royal Forest Department. Leading the teams were Pol Lt Col Montree Bunyayothin, Director of the DSI’s Bureau of Natural Resources and Environmental Crime, and former Sirinath National Park Chief Cheewapap Cheewatham, who now serves as the Director of the Strategic and Forest Protection Division of the Royal Forest Department. 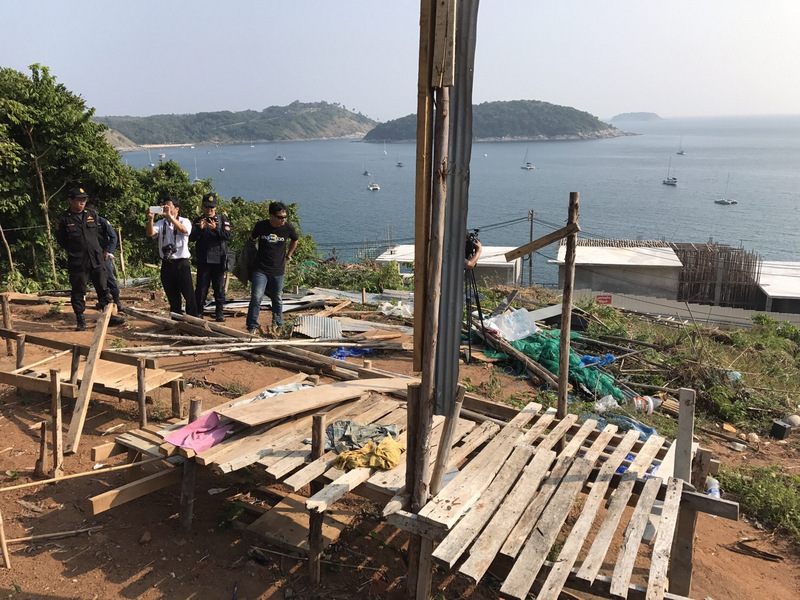 The inspection yesterday, however, began with investigation of the worker’s camp across the road from where the luxury residences are being built following a complaint being filed against the camp in August last year. At the worker’s camp the officers found nine huts and a water tank and fence blocking a waterway that once flowed across the site. Rawai Municipality officials confirmed the waterway once served other people in the area. The huts were home to several families, with women and children living on the site. Officers also found a small pineapple plantation in the area. 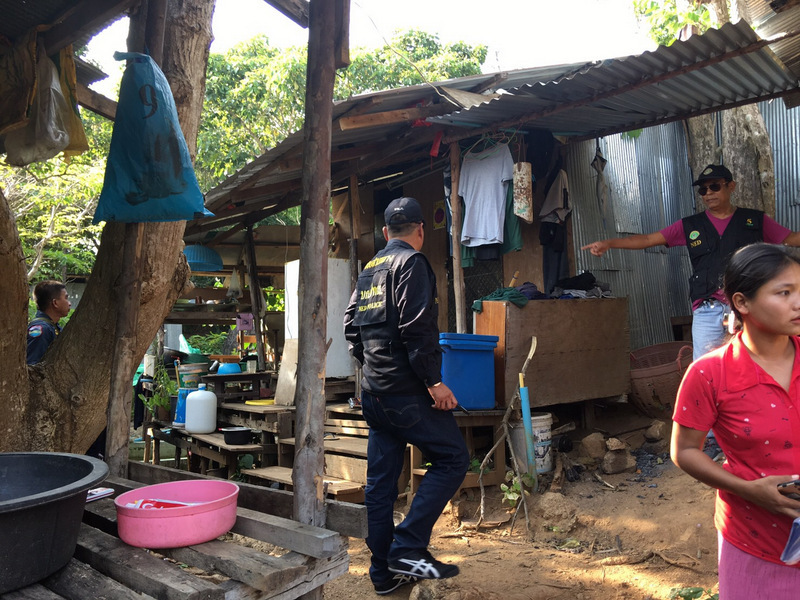 One male worker at the site confirmed to the officers that he worked for Supphachai Boonnan, who the officers called to the site to answer questions. Mr Supphachai said the land “belonged” to Thanathorn Tienngurn, who he called the “owner” of the construction project that was building the luxury residences across the road. Mr Thanathorn was then called to answer questions about the construction of the luxury residences. Mr Thanathorn told officials that he was unable to present the land document to officials, but claimed that he had evidence of “owning” the land via a PorBorTor 5. A PorBorTor 5 entitles a person to occupy land by evidence of paying land tax for the plot, but by law may not be built upon. Not questioned yesterday was that a Chanote land title, which bestows the registered owner full rights to a plot of land, had already been presented to the DSI in September last year. Regardless, the team of officials yesterday declared that the land was a protected forest area under the Forest Act 2484. The team led by Mr Cheewapap recorded the plot boundaries with GPS, after which Mr Cheewapap requested the DSI to continue their investigation. The construction of the luxury residences gained notoriety last year after images of the construction went viral online amid a storm of controversy accusing the project of ruining one of the best viewpoints on the island. 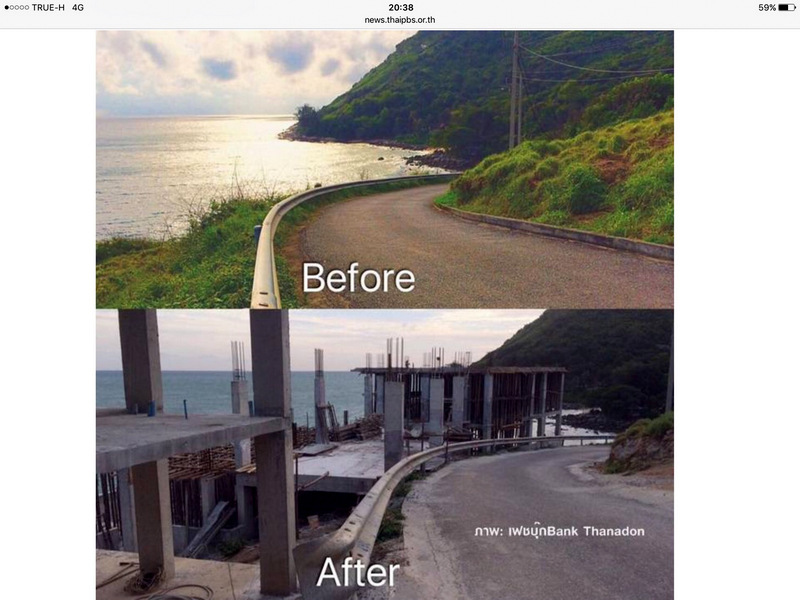 Then on Sept 25, Mayor Aroon told The Phuket News that demolition of the property is not yet complete as he was still awaiting instructions from the Phuket Governor. Mayor Aroon  play the game all the time, take a look back side from his office all the food stall are back on the beach "illegal food stall" the same in Nai Harn beach the food stall be bigger and bigger for every week. So money walking in Rawai into some one`s pocket. Corruption is still thriving extremely well in Thailand. So, according Forest Act 2484, all construction and surrounding destroyed area by workers camp are in fact a crime! Did Mayor Aroon not have the intellectual luggage to check that out previously? Prevented criminal activities in his jurisdiction? He approved revised illegal construction plans, but waited  for the Governor. And the Governor? Didn't act.